Solid state lasers date back to the 1960s with the first laser ever invented being of the laser variety. The original solid state laser was a ruby laser that generated an intense flash of blue-white light. The word “laser” stands for Light Amplification by Stimulated Emission of Radiation. Technically speaking, lasers do not amplify light but rather, they generate it. Laser light has unique characteristics of monochromicity, coherence, and directionality. 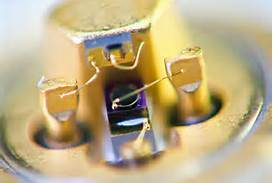 While semiconductor lasers are often called solid state lasers, those are actually “diode” lasers which are their own class of lasers. Solid state lasers use a solid crystalline material as the “lasing” medium. In contrast, other laser types use gas, liquids, and semiconductor crystals as the lasing medium. Certain atoms found inside the crystalline host can be “excited” by external light, a process that produces laser light. The light generated is in a very tight beam, and it can be tightened or manipulated even further, making laser light extremely versatile in numerous fields including the healthcare industry and industrial cutting and welding. The energy pumping system stimulates the lasing medium’s atoms, ions, and molecules to “energy level 2.” At this point, some of these atoms, ions, and molecules will naturally degrade, going back to their ground state and emitting a photon of light in a random direction. It’s these spontaneous photon emissions and their interaction with excited atoms, ions, and molecules that give laser light its unique properties. When a naturally emitted photon and an energy level 2 part interact, another photon of light is released. These secondary photo emissions are of the same exact wavelength, phase, and polarization, and they are emitted in the same exact direction. The light beam generated by this process is monochromatic with all of its waves occurring in step with each other. With a laser, the light is collimated; its rays are parallel. As the process continues, more and more secondary photons are emitted. Depending on the strength of the pumping system, the light can be generated indefinitely resulting in a continuous wave laser. Less capable pumping sources cannot sustain indefinite light generation; thus, they result in pulsed lasers. In either case, solid state laser light can be manipulated and used in various applications. Mark Williams is the author of this article about solid state laser. He is an engineer and science nerd who loves to learn about laser technology. He uses many resources from laser company like Coherent to write about this article. Article Source: EzineArticles by Author Mark Williams .